Despite the explosive growth of wireless mobile devices, particularly smartphones and tablets, at least one longtime chipmaker looks to be shying away from that market. Reuters reported that Dallas-based chipmaker Texas Instruments has started to expand its business beyond investments in mobile wireless, which currently includes powering Amazon's Kindle Fire tablet. 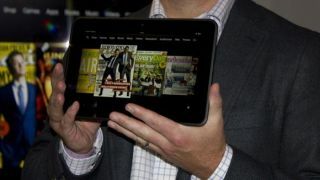 Amazon's latest Kindle Fire, the Kindle Fire HD, sports a TI OMAP 4470 processor. In a webcast meeting with investors, Greg Delagi, TI's senior vice president for embedded processing, painted mobile as "less attractive" for the company moving forward, which analysts view as the beginning of the end of the company's smartphone and tablet ambitions. "TI made it very clear they no longer want to be in the business of proving application processors for smartphones or tablets," remarked Longbow Research analyst JoAnne Feeney to Reuters. "What remains uncertain is for how long they'll support customers." For the time being, TI promises to continue supporting mobile application chip customers, but won't invest as heavily into its future roadmaps where tablets and smartphones are concerned. Texas Instruments plans to instead focus its efforts on industrial clients, such as auto makers, where the company sees future growth for its embedded chip business. Judging from the company's stock, the announcement on Tuesday made investors nervous, with a three percent decline over worries that TI's new direction would adversely affect their bottom line.